Second in a series. See Part I here. Comic-Con did not take up the entire convention center that first year. If memory serves me right, I recall that there were other shows/conferences going on concurrently, one involving primarily elderly women (I think it was some kind of knitting show) and another that seemed to involve a lot of bikers! Afterwards, however, Comic-Con would take up the entire venue every year, even after the convention center doubled its size in 2001. That year, 1991, proved to be another whirlwind visit—my brother flew down from his home in Northern California to attend the show on Saturday, but we drove back to L.A. that night so that he could catch his flight home. Though I didn’t plan to, I had so much fun and unfinished business, I drove back down with other friends and my girlfriend (now wife) the following day! The 1992 show was another landmark, with Batman, the Animated Series, and Image Comics exploding on the scene that summer. The real watershed for me, personally, was 1993, the year the San Diego Comic-Con introduced its Small Press Area, which was my debut as an exhibitor. (The cost for a table that year in the Small Press was $75!) Since then, to date, I’ve exhibited at 18 San Diego Comic-Cons, as well as 3 Alternative Press Expos (APE), 3 WonderCons, 1 Chicago Comicon, a show in Toronto, and a Spirit of Independent Tour stop in Seattle. 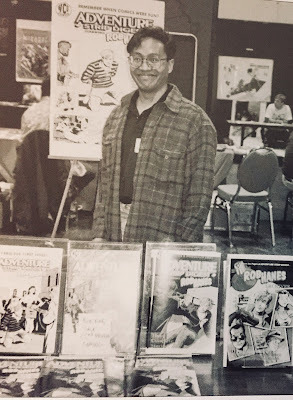 For some context, let me provide a little bit of my publishing/comics history: it wasn’t until after college, in the mid-’80s, that I became serious about doing comics. Though I had done “home-made comics” and kept sketchbooks, it wasn’t until this time I began to seriously produce full-length stories at a professional, print-ready level. As one can imagine, those earliest efforts were pretty crude (and cartoony). In fact, I ended up not publishing those early stories in the regular series until I released them in a separate “special edition” series for non-canon work just recently (Rob Hanes Adventures Special Edition #2). Nevertheless, I began showing the work around and, as this was the dawn of the self-publishing/independent movement, got a few bites that never materialized (usually because the company went under just after the first issue was solicited!) It was at this time I discovered the small press zine movement, complete with their own newsletters and reviewzines, which was a DIY route I found very fun and appealing, and gave me an outlet to publish my work in zine/ashcan format (printed at my local Kinko’s/copy shop) while I developed. I soon gained some recognition and even a few minor awards for my work – I also began sending copies of my zine to publishers and industry professionals and got attention that way as well. So, yes, I was there for the debut of Comic-Con’s Small Press Area in 1993, with ashcan copies of Adventure Strip Digest on hand. That first year, I got to meet fellow pros like Karl Kesel, Scott McCloud, Kurt Busiek (who discovered my work early on and even re-designed my Adventure Strip Digest logo), and Don McGregor. Jeff Smith was also in the Small Press Area that first year, with his earliest copies of the great Bone. I even participated in my first panel at that show, along with, among others, Dave Sim (Cerebus) and Shannon Wheeler (Too Much Coffee Man). (At one point during the panel discussion, Sim held up one of my zines and said that although it was “pro-level quality, Randy is willing to take his time and play Triple-A ball for awhile. There’s no rush.”) Boy, in retrospect, he sure wasn’t kidding! (I participated on panels again in 1994 and 1998). It was also a bit of a cheap thrill to be recognized at events by people who were fans of my work, simply by my name badge when out and about. In 1995, with Adventure Strip Digest now available as a full-sized comic-book, I shared a regular booth with fellow indy publisher B.C. Boyer (Hilly Rose) and had another successful show. At that show, I recall connecting with Jeff Smith, Mike Mignola (Hellboy), and Mike Vosburg (Lori Lovecraft). 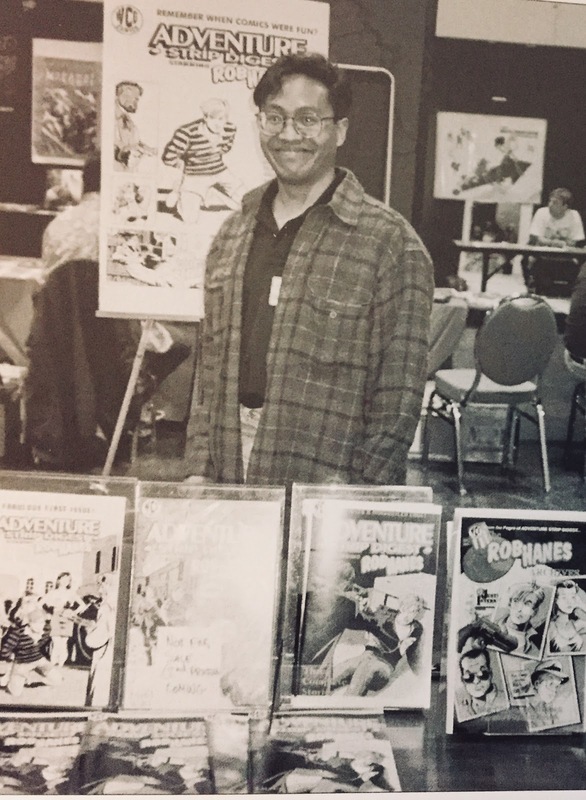 That year, at that year’s Eisner Awards, I also was in the running for the Russ Manning Award for Most Promising Newcomer, alongside Jason Lutes (Jar of Fools) and Terry Moore (Strangers in Paradise). Good company to be in! That year, I actually also had a bit of a memorable adventure that fortunately turned out well. At the time, I was using a very small printer who had a rather bad reputation for meeting deadlines and not even fulfilling orders, though he had always come through for me, though with some prodding—I have to admit, I think it's because he liked my stuff. 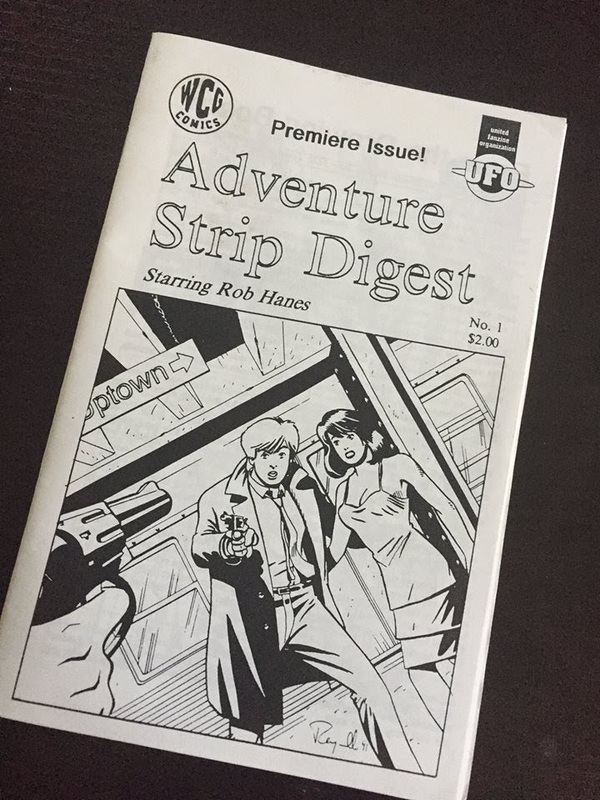 As many printers do, he promised to ship issue 4 of my latest issue, Adventure Strip Digest, to me at San Diego, but on the second day (Friday) of the 4-day show, I still hadn’t received the shipment! In many ways, this was the heyday of the Comic-Con, when comics were still a central part of the show before it became a broader pop culture phenomenon that became a big umbrella for all kinds of fandom. 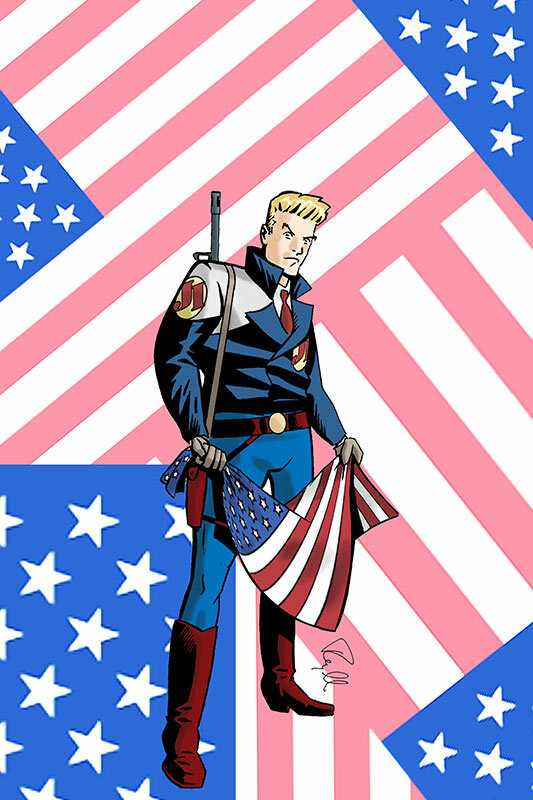 It was also a heady time because, as the new kid on the block, in those years I connected with retailers, distributors, editors and publishers, people in the entertainment industry, and others interested in carrying my comics, licensing it for other media, or working with me. These included many of the top studios in Hollywood and numerous production companies. 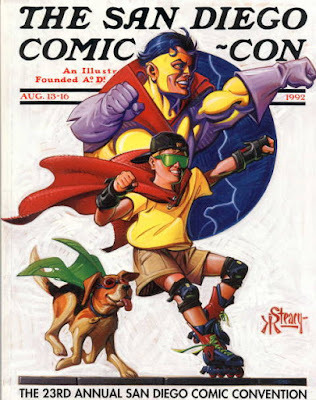 Though I don't think they're necessarily related, the explosion of Comic-Con in the 1990s coincided with the rise of the small press/indie comics movement of the same period—a trend recognized by Comic-Con when it introduced the small press area. The small press continues to be a great engine of activity and creativity—new technologies like print on demand and the web (and social media) have vastly democratized the comics industry and lowered the barrier of entry to producing a comic-book. By the same token, as a result, there has been an explosion of product, making it very difficult to be noticed and break through, even for quality comics. Although Comic-Con really exploded at that time, it was not yet quite as wide-ranging and fragmented as it is today. As proof of these, there were several years where there was often one big off-site party (at least one of which, if not more, was hosted by Fantagraphics). These technically needed an invitation to enter, but it was fairly easy to get a "ticket"/flyer. They were really nothing more than large kegger parties where people could hang out, relax, mingle, drink and smoke. It was in later years that Comic-Con would expand and fragment, including more exclusive Hollywood parties that were as much a press junket as a party. One of the great traditions of my buddies and I after the end of the convention back then was to meet up at Anderson's Split Pea Soup, a full-service family restaurant famous, of course, for its famous split pea soup as well as its distinctive windmill that could be seen from quite a distance. Located in Carlsbad, about 35 miles north of San Diego, it was a nice meeting point on the drive home where we'd meet for a late dinner and celebrate the end of another show. Next: The series relaunches and Comic-Con matures.